When I initially suggested to my better half that he wine and dine me at a French restaurant that was around the corner from where I used to live, I never actually dreamed I’d get to go. And on Valentines’ Day too. As the day came nearer, I felt I was betraying my supposed modern-(currently straight) girl lifestyle by being excited. I had good cause to be excited. We would be dining at Libertine, in North Melbourne, and it was a six-course dégustation with matched wines. Quite possibly the most grown-up meal I was ever likely to have. Incidentally, I have been to a dégustation where each course was matched with a beer, but I know a little more about beer than I do wine, though I started my legal drinking career as a just-wine quaffer. The waitress who welcomed us asked if we wanted an apéritif. Being a massive lush, how could I say no? I asked her for her recommendation and she suggested a few things, and I settled upon the Floc de Gascogne which is a pear armagnac. Delish! 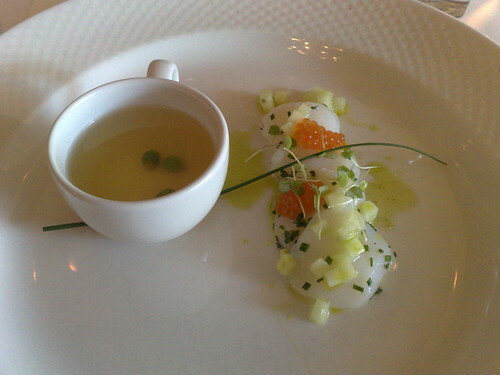 Our very first course was the Hervey Bay scallops ceviche, tomato consommé & Yarra Valley salmon roe. Initially, I worried that the serving was too small. I probably say that because I gobbled my serve up much faster than my partner. This entrée was refreshing and palate cleansing. I wished I had more of the consommé – the idea of drinking a rather savoury liquid might initially seem foreign, but I could have had more. My partner was not as keen on it as I was. This was matched with a champagne – NV Vazart-Coquart Brut Reserve. We were dutifully informed that it was made from chardonnay grapes, is blanc on blanc which gives it its slightly acidic, clean, crisp finish. It initially tasted like white wine but then had a hint of savoury on the palate. My favourite wine of the dinner, and probably the best champagne I’ve ever had. 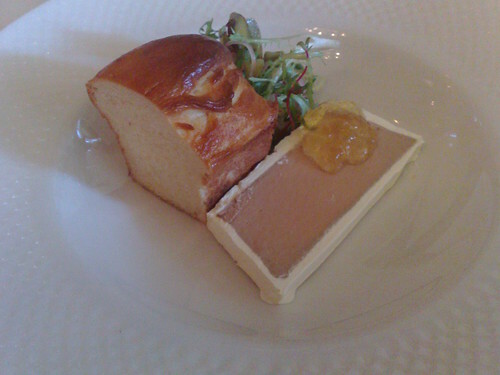 The second course was foie gras parfait with botrytis sémillon jelly & brioche. The foie gras was encased in blanched (in colour, not in method of preparation), whipped butter which offset its richness perfectly. I must confess that I didn’t think the sweetened jelly really worked with the pâté. It feels like terrible sacrilege to say that! However, it matched the glass of the 1996 Coteaux de la Biche Vouvray Moelleux ‘Collection’ from the Loire Valley, France very well. The wine was sweet and though the waiter told us this particular one is not affected by botrytis, further online investigation actually suggests the contrary. I felt it was actually pretty desserty and too sweet for my taste. I would have ideally preferred a wine more savoury and matched to the pâté. It would have been so easy to consume more of the pâté but again, Libertine were judicious with the serving size. A smidgen more and we would have been full, which is no good for the rest to come. By the end of these subtle, tantalising entreés, my appetite was whetted for more substantial fare. Spoilt me got my wish. If the plate is looking a little bare, don’t be alarmed: alongside the Rose veal rack & sauce Périgueux featuring winter Périgord truffles, was a hearty ratatouille. Full disclosure: I am not a big fan of squash as a vegetable, and ratatouille had it in spades. However, I ate it with gusto on this occasion. The rustic, aromatic herb and garlic breadcrumb crust made the vegetables a treat. We were informed that Rose veal is slightly older than standard veal and is put to pasture. It is also from Warrnambool. Someone from the kitchen would come and lovingly dole out portions of the meat and selected vegies, then another would give us veal jus and the ratatouille in a separate pot that we could help ourselves to. 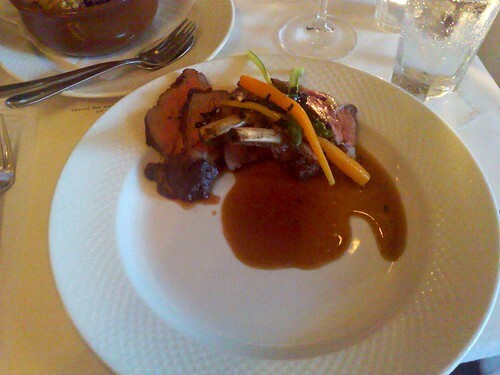 The wine selected to accompany this course was the 2001 Château Tour Haut Moulin, Haut Médoc, Bordeaux, France. So moreish! I was crestfallen that I missed out on an extra glass of it because my partner was slower (or more polite) in his wine guzzling than me. Unusually for me, the main was my favourite out of the savoury courses. I’ve had veal only once before and it was extremely disappointing, but Libertine have turned me around to its appeal. I’ll never be able to become a vegetarian again, honestly. 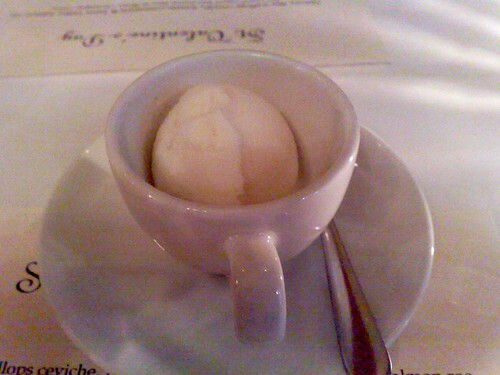 At this stage of the meal, it was time for a palate cleanser, an espresso cup with white chocolate vermouth sorbet. I can’t quite commit to an opinion about these two flavours together. Definitely interesting, but it didn’t quite knock me out of its chair. No such trouble for the next dessert of warm Heidi raclette feuilleté with apple purée – easily my favoured out of the sweet courses. 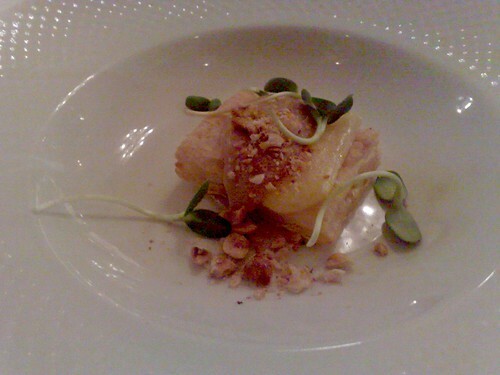 You’ve got apple purée, Swiss gruyère, crushed hazelnuts, and those tender green shoots are sunflower shoots! The waiter did not hesitate to find this out for me. They are very savoury and more flavoursome than watercress and even alfalfa. But in honesty, I am a base creature – melted, pungest cheese with a slightly tart fruit? Hell yes! Alcohol-wise, it was accompanied by Henriques & Henriques ‘Finest Medium Dry’ 5 year old Madeira which is sweet, and somewhat like sherry. 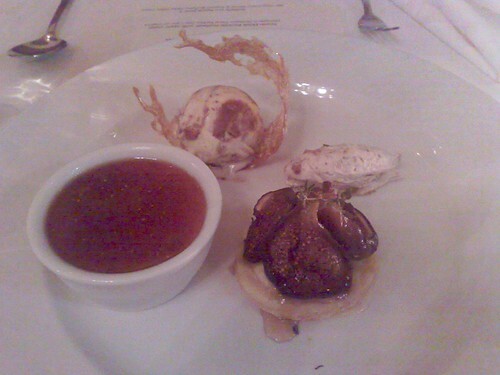 The indulgent dégustation was coming to a close in the form of figs ‘reworked’ in the following ways: crème brûlée with fig compote as topping (part of me feels that it’s not a true brûlée without the burnt sugar taste); fig-flavoured cream; fig on pastry with thyme (would have loved more thyme); hard caramel encasing fig ice cream. 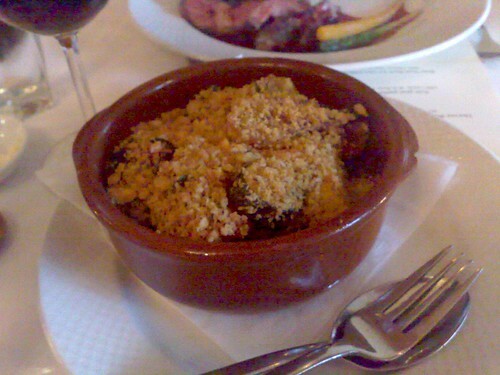 With this we were served the 2007 Delas Freres Muscat de Beaumes de Venise, from the Rhône Valley, France. It didn’t smell overly sweet but rather slightly acidic and a little bit sour. Not quite what I was expecting. At the very end of the sumptuous dinner, we were given petits fours, and had a choice of either coffee (which partner had) or tea. I elected to have Darjeeling tea. I was hoping for the offer of a digestif, but none was made. To give an indication of just how much I loved dining at Libertine, not long after I decided to get together some foodie friends and food bloggers to take advantage of their suckling pig feast (they require a minimum of ten people to book for said feast). They recently had a Wednesday special where they would offer bouillabaisse, but I wasn’t able to dine there to sample it. French cuisine is not something I have considered much, but my visit here has piqued my interest and cannot wait to return. It’s not somewhere I could personally afford to dine at regularly, but that just makes it more of a treat. A bientôt, Libertine! This entry was posted in eatie-foodies dining out and tagged degustation, French food, Libertine, matched wines, Melbourne, North Melbourne, restaurant on March 14, 2010 by gem.